Essence is a magnificent acrobat duo, formed by Levgeniia and Elena. These corporate entertainers began their careers in acrosport, where they obtained considerable successes and were ranked international masters of the sport. However, afterwards they decided to devote themselves to the circus art. Their acrobatic number shocks – two individual women come together to make one whole. It’s a bewitching picture – the essence of passion. From 2009 till 2013 they made an acrobatic trio act, they are now a duo. They can perform at weddings and other private parties but are mostly booked as corporate entertainment. In September 2009, “Essence” became the silver prize winners of the international circus festival – Nikulin in Moscow. In October 2009, “Essence” became the silver prize winners of circus festival Citta di Latina. In December 2009, Essence were awarded a special jury prize at an international festival in Holland in the town of Enschede. In January 2010, they participated in the international circus festival in France, and were received the special Circus Club of France award. In March 2011, Essence were the bronze medallists of the International Circus Festival in Izhevsk. In 2014, Elena and Levgeniia began work on their new act – Chinese pole. 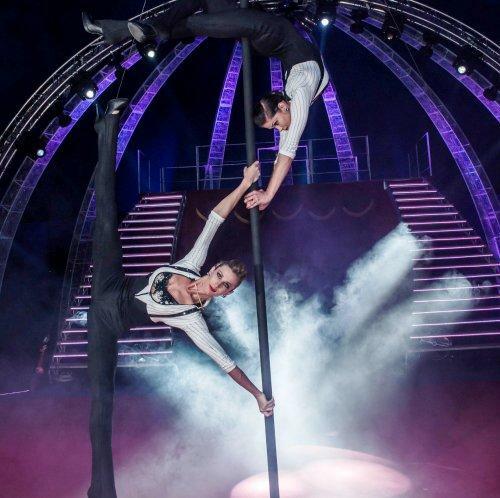 In June 2014, they received the gold prize at the international circus festival “Golden trick of Kobzov”. The act lasts between 5-6 minutes. Height of the pole is 5 metres. Weight of all the props is 60-65 kilos. The length of the longest part of the pole is 2 metres. On the stage they need 4 points on the floor to attach their metal rope. They can take it on a flight as luggage.